It’s your move, Mustang and Challenger. The new Chevrolet Camaro ZL1 has got your number, or more correctly, has beaten your best horsepower numbers … by a lot. How does the high-performance ZL1 coupe and convertible square with General Motors’ greenification program of introducing fuel-sipping electrics, hybrids plus a couple of new ankle-biter subcompacts? Well, the eco trend is definitely here to stay, but at the opposite end of oil barrel, GM’s cornerstone division isn’t neglecting its involvement in the muscle/pony car bracket. Although relatively small, the pedal-to-the-metal-gunfighter class remains unequivocal in its No Imports Allowed policy. And in this club the numero uno bylaw states that horsepower rules and absolute horsepower power rules absolutely, or at least until another club member ups the ante and overthrows the leader. The 2011 edition of the Chevrolet Camaro’s SS model was rated at 426 horsepower and was certainly nothing to be sneezed at. But it couldn’t catch a cold next to the Dodge Challenger’s SRT8 392 that generated 470 horses from its 6.4-liter “Hemi” engine. That goes double for Ford Mustang-based Shelby GT500’s 550 ponies that emanate from a supercharged 5.4-liter V-8. With bragging rights on the line, you just had to know that Chevrolet would eventually retaliate. The ZL1 response evokes memories of a highly revered name (an engine option order number, actually) from 1969 that Camaro followers have likely read about, although few have viewed up close. Chevrolet built a mere 69 copies, with many of those being employed by professional drag racers. The original all-aluminum ZL1 racing engine reportedly produced in excess of 500 horsepower, which was an off-the-scale number back in 1969. 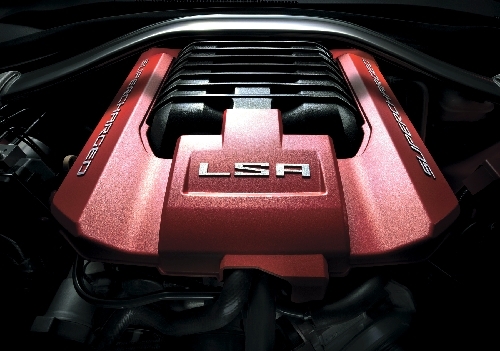 The 2012 edition’s supercharged 6.2-liter V-8 — a variation of the engines found in the Corvette ZR1 and Cadillac CTS-V – to a six-speed manual transmission and dynos at 580 horsepower and 556 pound-feet of torque. This makes it the most powerful production Camaro ever built and, Chevrolet proclaims, will be the most powerful Chevy droptop ever. 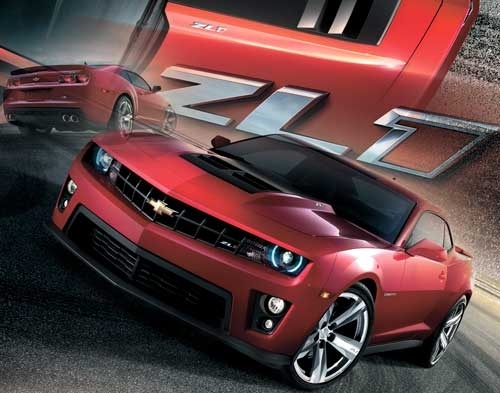 The ZL1 constitutes much more than just unbridled horsepower, but represents a thoroughly sorted out performance platform where nearly every component has been beefed up or completely redesigned to handle the engine’s hefty output. Today it’s no longer now about straight-line drag racing (although sub-four-second runs to 60 mph are apparently doable), but rather it’s about constructing a car that’s highly competent on the street as well as on road-racing courses where numerous owners will stretch the ZL1’s legs. 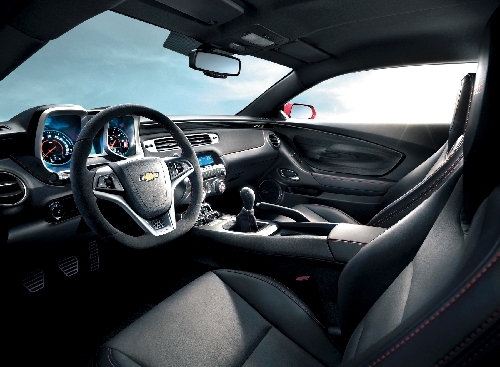 Both driver and their front passenger should have no problems stretching out inside the Camaro’s generously sized cabin with its power-adjustable heated leather seats with grippy suede-like inserts. They’ll also appreciate the sounds from either the Boston Acoustics audio system or the dual-mode exhaust system that becomes freer flowing (and louder) when the driver opens the taps a bit. The ZL1’s exterior displays a unique front air intake and a lightweight aluminum and carbon fiber hood. Its built-in extractors help direct airflow over the car for added road-hugging downforce. Other visuals include vertical fog-light pods that double as intakes to channel cool air to the massive Brembo-brand brakes. The package is only partially visible through the 20-inch forged-aluminum wheels supported by ZL1-specific Goodyear tires. The specialized hardware extends to the suspension that uses GM’s Magnetic Ride Control, which uses special shock dampers that constantly vary the degree of firmness, according to road and driving conditions. There are also Tour (soft) and Sport (firmer) settings that the driver can dial in. Most of the remaining suspension components have either been strengthened or swapped out and that extends to the driveshaft, axles and the heavy-duty limited-slip differential. With a base price estimated in the $48,000 range, a ZL1 coupe will cost about $15,000 more than a Camaro SS. That might seem steep, but it’s similar to the cost of a Shelby GT500 and Dodge Challenger SRT8. The response from that pair should be interesting to watch, and even more interesting to drive.